Pore-free and crack-free layers with a long lifetime, high surface quality and exceptional durability. Laser coating is realized either as wire (laser hot wire cladding) or powder cladding. The laser beam creates a molten pool at the workpiece surface, to which is simultaneously added the laser coating material (wire or powder) molten by the laser. The exposure time is short, which creates only a short delay as the cooling is quick. 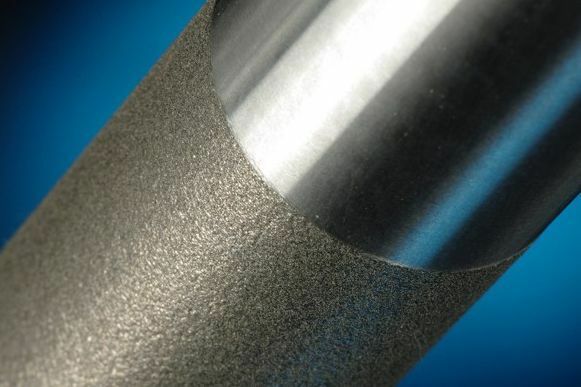 The result is a layer that is connected with the basic material metallurgically. It is tougher than those coatings created by thermal spraying, and compared to hard chromium plating, for example, it is harmless to health, too. The top-hat beam profile of a diode laser, part of the laser cladding equipment, creates a particularly even molten pool, which provides fine-grained, pore-free and crack-free coatings of the workpieces. Post-processing is thus reduced to a minimum. When integrated into systems for the Extreme High-Speed Laser Cladding, as developed by Fraunhofer ILT, our diode lasers are also suitable for creating very thin cladding coatings which until now could only be realized with hard chromium plating. The development of oil and gas fields requires high-performing drilling tools. These are subjected to huge stress and would not reach long lifetimes without wear protection. That is why special coatings, that are more and more frequently realized with the laser coating technology, have become the standard for some time now. Here, Laserline’s LDM and LDF diode lasers have achieved outstanding results: excellent adhesion, high precision, almost no porosity, limited crack formation, a high degree of hardness, and low deformation. In most cases, the created surface does not require any further mechanical processing. In comparison, conventional hard plating methods such as plasma powder cladding do not attain sufficiently long lifetimes. For customers engaged in oil extraction, mining, metal and paper industries, Technolgenia coats with the help of Laserline's diode laser components with a special tungsten carbide powder. Typical carbide layers meant to protect saw-blades, disc harrows or counter blades from wear and corrosion can be optimally realized with the help of diode lasers. Their calm molten pool leaves no impurities, and thanks to the superficial heat exposure, there is no delay to worry about. Iron carbide layers are possible, just as layers made of tungsten- or chromium-carbide. As the most successful coating method to date, hard chromium plating is being threatened by an EU-wide prohibition, such that the industry is searching for alternatives. Hitherto, laser-based cladding seemed unsuitable because the process was too slow and did not allow for sufficiently thin coatings. However, the Fraunhofer Institute for Laser Technology (ILT) has developed a patented method, which enables high processing speeds at low-layer thicknesses and needs less power than regular cladding, namely, extreme high-speed laser cladding. Laserline's diode lasers have been successfully used in High-Speed Cladding. Initially, the method was only designed for coating rotationally symmetric components, but is now supposed to be suitable for laser coating of other components in the foreseeable future.